Luxury brand new apartment , with amazing value for money. Excellent breakfast ! Friendly staff! Very big apartments with nice comfy beds and closed garage. Possibility to arrive after-hours and nice breakfast. Location in an urban area, very calm and silent only a few minutes from the Trier city center, not good if you don't have a car. Location was nice near from the inter change of the freeway. A market is near from the hotel. The building is new. Free parking. Good shower and bathroom. Good room size and table. Very modern and clean with a good buffet breakfast. Excellent breakfast. New fresh look of the room and bathroom. Clean. Extremely friendly staff and huge room. Shower was awesome! Friendly atmosphere, fantastic location (just at the corner of Campus II). Lock in a great price for Schroeders Appartementhotel – rated 8.3 by recent guests! 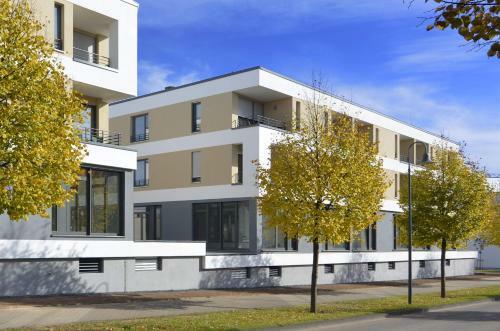 One of our top picks in Trier.Free Wi-Fi and a breakfast buffet are offered at these apartment rentals, located 650 feet from the Kürenz, Behringstrasse stop on bus line 4. Apartments have modern décor and come with a kitchenette. Accommodations at Schroeders Appartementhotel are bright. Each one comes with cable TV, a sofa, and a kitchenette. A private bathroom comes with a hairdryer and free toiletries. 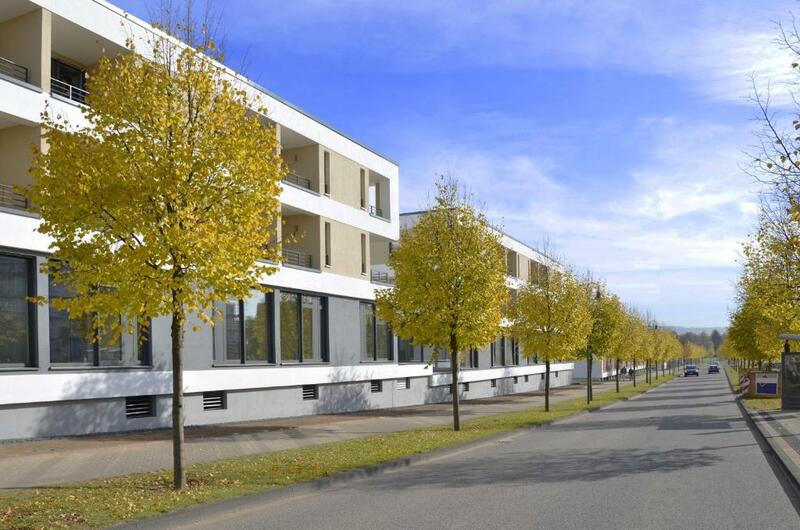 A shuttle service can be arranged, for an extra fee, to Trier Train Station, located 1.9 mi from the apartments. The Liebfrauenkirche Church is also 1.9 mi away. The A602 motorway is 3.1 mi from Schroeders Appartementhotel and the A64 motorway is 4.3 mi away. They provide connections to the Luxembourg border (9.3 mi) and Koblenz (75 mi). When would you like to stay at Schroeders Appartementhotel? This apartment has a kitchen and cable TV. 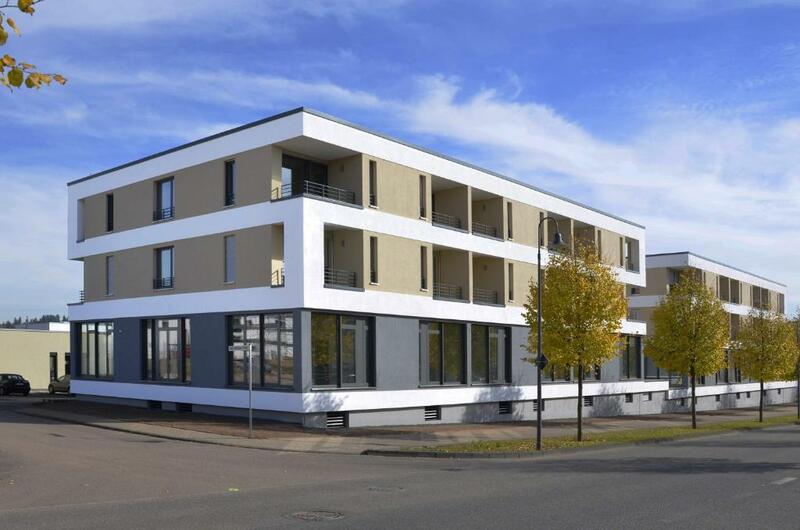 Schroeders Appartement Hotel befindet sich in einem 2012 neu erbauten modernen Komplex, dem der Architekturpreis 2012 verliehen wurde. Es liegt im Trierer Stadtteil Petrisberg unweit der Universität Trier. Das Appartement Hotel kombiniert Hotelkomfort und „Wohnen auf Zeit“ zu einem innovativen Wohnkonzept. Das Hotel-Garni spricht den Städtereisenden-Kurzurlauber ebenso an wie den Geschäftsreisenden, den Boarding-Gast oder die Familien. House Rules Schroeders Appartementhotel takes special requests – add in the next step! Schroeders Appartementhotel accepts these cards and reserves the right to temporarily hold an amount prior to arrival. Please call the property in advance for more details if you wish to check in after 12:00. Could have a higher variety of vegan food. No pin code provided to access the property, no staff to ask questions or provide help till the morning, no information guide in the apartment, kitchenette had 1 frypan, 1saucepan lid, 1 plate, no tea cups, kettle etc. Room was on the road side so had to close the windows because of the traffic, no ventilation. There was nobody at the reception at the time when I wanted to check in. It was a little difficult. Terrible and very rude staff, who left before we arrived, and kept phoning, in order to check us in, since he finished his working day early. Upon arrival we found dirty dishes stacked in the cupboard. The two apartments, intended for four people, there was only 1 glass, 1 small cup, and 3 knives. No bottle opener either. No air-conditioning. Loud - even the door opening system in the corridor, would be hear inside the room, and the bed also moves from these sounds - no sound-proofing. Location, location and once again location - very far from places of interest. Breakfasts are automatically included, but you are not told about this, nor where they would be. Payment is complicated. The room was very warm with no air con (and a smoking area outside the window). The location is out of town and you need to drive or take a taxi. Noisy street. No air conditioning. It was a warm night. We opened the window but were woken up by loud nose if driving cars. Need to improve check in process. We arrived late and the key for the bedroom was in letter box: this information was not specified. Hotel is in quiet area close to city center (about 6km by car). Big room, clean, with very good beds. Staff is very nice. Breakfast is OK.